3 points of any description will do. Strongest team, full throttle from the start, and let's put the worries about away form to bed. The league is our absolute priority, 3 points is a must. 3 points and the start of a good run of form away from home. Confident performance and three points. 3-0 to get off to this set of fixtures on a flyer. I reckon this game has DRAW written all over it. B*llocks @academical - this is when the Rangers juggernaut gets into top gear. 3 points, no injuries and no suspensions and we move on to the next victim. 3 points are a must tomorrow. Injury free and no bookings please. Saying 3-1 the Sons of William. C'MON THE RANGERS! ! ! ! The away results have to get sorted and sorted quick. The time for that is tomorrow. Hamilton are pish. We should pump them by atleast 4 goals. Expecting a strong performance after the international break. Full strength team, out and send a message. 3-0 Rangers, Kent to score first and then Morelos with a double. 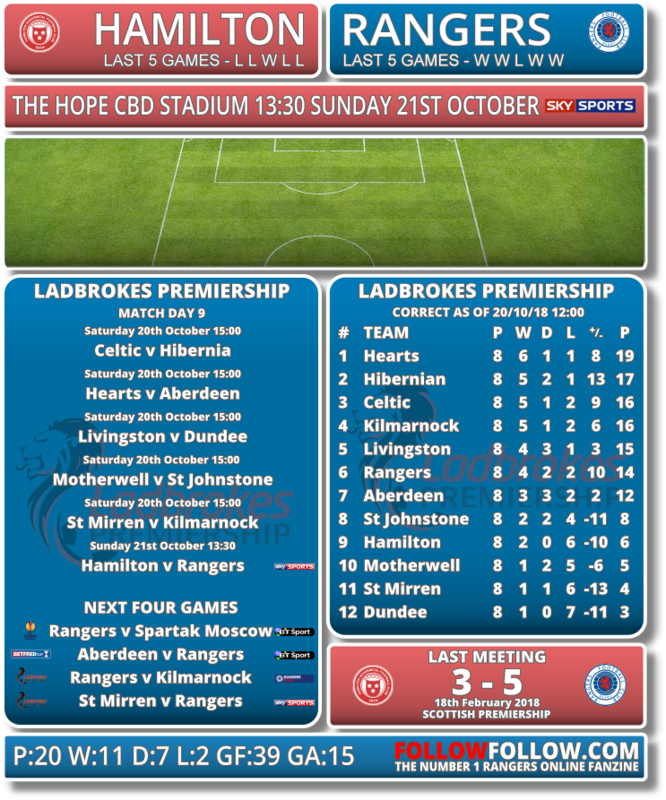 will Accies be bouncing the ball over the top like Livi do you think ? I reckon this match will be a comprehensive Rangers win. Let's make a statement rangers! I hope Grezda gets a run out, with a view to next Sunday. Simply have to win tomorrow. Even more so with Hearts and the bheggars winning comfortably. Not our style, so I doubt it. Trying to break quickly out of defence, keeping the ball on the ground, I expect. Barišić out, Flanagan not up to playing on plastic pitches (is that correct?). Halliday at LB if that's the case. Least he can take confidence from his showings this season. Arfield out is a big loss as well. Looking forward to seeing Big Sadiq tomorrow hopefully. A couple of goals would do his confidence good. Three points a must. Keep going for 55. Its a must win now. 3 points required, absolutely no excuses. Hamilton are on a shocking run and we need to start climbing the table. Ironically the way results have gone today it will be 5th at best if we win tomorrow. Time to hammer Hamilton tomorrow. Apologies @academical but on this occasion f,uck yeez. No personal harm meant with my post. 3 points is a must tomorrow, if we have ambitions to win the league we can't afford to drop points to Hamilton. Every game we play we see these endless forecasts of huge victories. The fact is EVERY away match is a problem for us right now. Our away form in Scotland is abysmal. We need to put that right. I’m optimistic that we will win tomorrow but I won’t be forecasting any stroll-in-the-park. I just want a win with no injuries or suspensions first and foremost. Mon the Gers, just do it. Results today make this even more a must win game. Confident we will win well. It pains me to say it but I hope hearts keep winning as long as the filth are above us in the table! I have a soft spot for the Accies, hope they get pumped tomorrow, hate saying that as I really enjoy your posts, and my brother in law will rumble on about Canning. Exactly. Our away form is a real concern, SG makes all the right noises but continually picks the wrong team, he simply has to get things correct tomorrow. Wonderful to see a match thread again. Two week international break feels like a life sentence. I fancy the team to come flying out the traps tomorrow full hunger and determination to win. Can afford no Livi like performance. 100% from the ko , no let up and we should be fine.